“A bigoted braggart with a laughable grasp of public policy and leering manners of the kind you would expect from a barroom drunk. What Stephens writes is a visible reminder of how much the mainstream of Corporate America – the US capitalist class – has lost control over their main and favored party. Some argue that there is no difference between the two parties, but that’s not true – no more than claiming there’s no difference between a defensive lineman and a free safety in football. They each have an important role to play. When the capitalist class feels itself in the driver’s seat, when it is moving forward, then it is able to put the Republicans in power in order to maximize the attack. When it has to maneuver, tack this way and that, even retreat a little bit – all in order to prevent a rout – then the Democrats are necessary. The compromise they had to have over the last eight years shows. Internationally, the Republicans showed they were incapable of putting up a presidential candidate who could maneuver and play the diplomacy game. And they also learned that they couldn’t just continue attacking – just invading one country after another without even any serious allies. So they put Obama in the White House. But domestically things were different, so they maneuvered to get a Republican majority in congress to make sure no concessions were made at home. But now, that arrangement threatens to come unravelled. Internationally, the age of US control over practically every corner of the globe is over. Its weakness – humiliation, even – is increasingly there for all to see. The Republicans are raising a hue and cry over this, stirring up xenophobia, along with a completely unrealistic view of what the US military can and cannot do. “We will carpet-bomb (ISIS) into oblivion. I don’t know if sand can glow in the dark, but we’re going to find out!” says the “glib moralizer” who’s “detested” by all his fellow Senators. “I will…quickly and decisively bomb the hell out of ISIS, will rebuild our military and make it so strong no one — and I mean, no one — will mess with us,” says the “bigoted braggart”. “A compulsive liar with a persecution complex, a mania for secrecy, and a bald disdain for rules as they apply to lesser people. 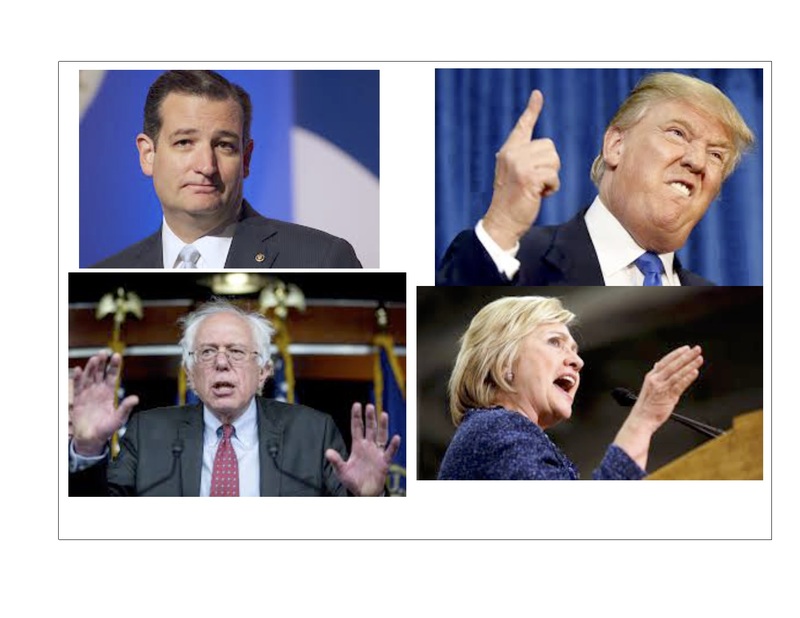 The four leading candidates, clockwise from top left: the “glib moralist”, the “bigoted braggart”, the “compulsive liar” and the “Sixties radical”. For different reasons, none of them is acceptable to Corporate America. The fact that Sanders could win in essence 50% of the vote in conservative and rural Iowa is extremely significant. It speaks to the enormous discontent that exists as well as the widespread acceptance of the term “socialism”, meaning a rejection of “capitalism”. This is what explains the hatred for Sanders that is fairly dripping from the fangs of Bret Stephens. His few words here pale by comparison to what they’d be saying about him if, as is extremely unlikely, he got elected. Then, they’d be mobilizing against him, and even his own party, the Democrats, would not defend a single priority he’s put forward. Many, probably most, would be joining in that mobilization against Sanders’ program. Meanwhile, despite the fact that Sanders is doing them a great favor by channeling the anger back into the Democrats and thereby strengthening them, Corporate America still must denounce him. But how to explain their description of Clinton? Consider the scenario: The Republicans nominate either the “glib moralist” or the “bigoted braggart”, and the results are predictable. As Stephens says, in that case we might as well “just elect Hillary now.” After all, if nothing else she is a reliable representative for them. But they also know that she has almost no credibility. Nor is she anywhere near as charismatic nor as glib as the current president. And she’ll be sitting in office at a time when the economy will be threatening to unravel again and who knows what international crisis will require new “sacrifices” from US working class boys and girls (more body bags, in other words). No, this situation will not suit them at all. But what can they do about it? Good article, John, but I think you mean to say “rout”, not “route”.